If you’re keen to recreate some sea-faring adventures at home - similar to those we enjoy at our messy play sessions - we’ve got some fun and creative ideas for you to try. First up we have these super fun wooden party spoon pirates - don’t they look great? Not only are they fun to make but they’re perfect for using as puppets, for a spot of role playing. Obviously you’ll need some wooden spoons - in this case, I Heart Crafty Things have suggested wooden party spoons as opposed to a regular more heavy-weight wooden spoon - but the other materials you’ll probably have at home. We’ve picked this idea because it ties in with our pirates theme but you could adapt it to make fairies, animals or whatever takes your fancy! How about trying your hand (get it?!) at this hand print pirate. Great isn’t it? You’ll need some paint and brushes to create these little masterpieces, and some paper of course. There’s the opportunity to personalise your pirate with stickers or a different expression. Here’s Fun Hand Print Art Blog’s instructions. We always like a paper plate suggestion and here’s a great pirate inspired one from Life as a Mama. There’s no instructions with this one but you can hopefully see how to go about making one with a spot of paint, some coloured paper and a little bit of creativity! Toilet roll tubes play a great part in our crafting activities too - don’t ever throw them away! This double act of a rather friendly-looking pirate and cute parrot is great fun to make. It can be a little fiddly for younger hands but older children get some (supervised) scissor practice in. What do you think? This one comes from MollyMooCrafts. And why not extend the fun to include bath time? These cork pirate boats, made from three corks and elastic bands, float beautifully and you can personalise the sails so if you wanted to make a fleet of rainbow coloured boats, the choice is yours! Red Ted Art have come up with this fab idea. A hat is always popular, and this pirate hat idea would be perfect for a pirate-themed party or just a spot of role playing at home. You’ll only need a few materials, all of which you might have already. Take a look at Sand In My Toes instructions and get making! If you’d like to focus on a sensory activity, we like this pirate sensory bin. It’s got lots of great textures and colours included, and is easy to recreate using things you’re likely to have at home. Don’t feel you need to replicate this exactly! If you’ve not got black beans to hand, or can’t get hold of any, you can use any dried beans, or lentils you have. This example from Counting Coconuts has pirate figurines but these aren’t necessary if you don’t have any. The booty and treasure are what makes this so attractive so dig out any old costume jewellery or left over foreign currency and see what you can come up with! Of course, all this creating will make landlubbers hungry! This clever little snack using circular cheeses, is great fun. It comes from Party Ideas UK but we don’t think it needs to be restricted to parties! For the end of the day or other quiet times, how about some pirate-themed reads? Ten Little Pirates by Mike Brownlow and Simon Rickerty is a super book for helping to learn numbers and has lovely illustrations. It also comes in princesses, monsters, dinosaurs and a festive elves version. For those still in nappies, you can plan ahead with Pirate Pete’s Potty by Andrea Pinnington. It’s a great tale with, of course, the idea that it will introduce the idea of potty training in a fun way. If you’d rather have a girl version, it comes as Princess Polly Potty too. 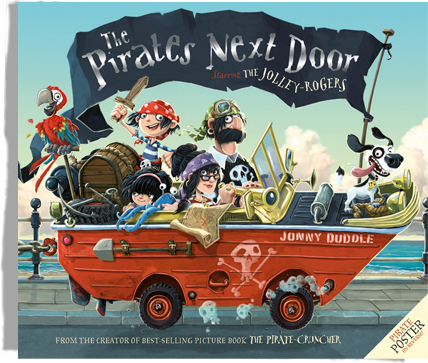 If a good story is what you’re after, The Pirates Next Door by Jonny Duddle, should hit the spot. It’s all about a pirate family who have quite an effect on the town they move to. The book has some beautiful pictures including an impressive gatefold.